South Africans have paid tribute to Hugh Masekela, the legendary jazz musician and activist, who died on Tuesday aged 78. 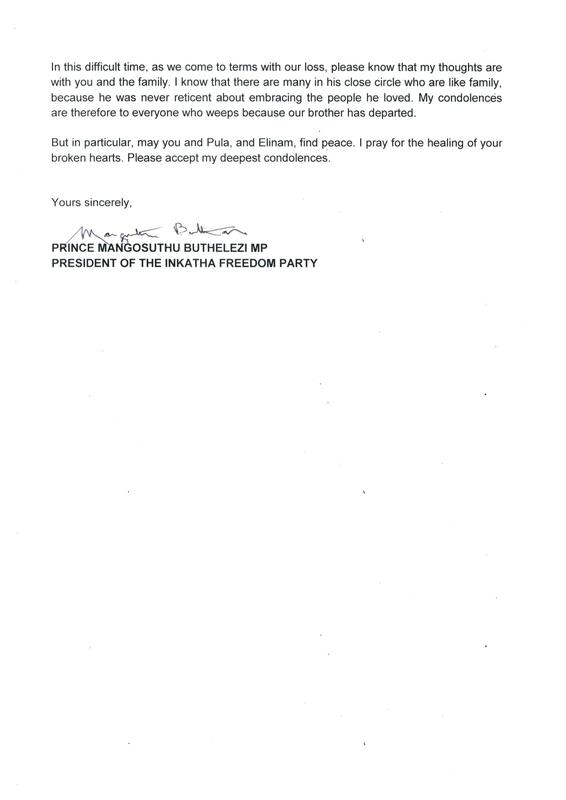 The South African president, Jacob Zuma, said the nation would mourn a man who “kept the torch of freedom alive”. The arts and culture minister, Nathi Mthethwa, described Masekela as “one of the great architects of Afro-Jazz”. 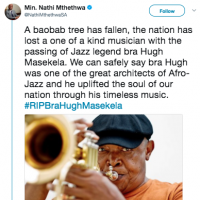 “A baobab tree has fallen,” Mthethwa wrote on Twitter. 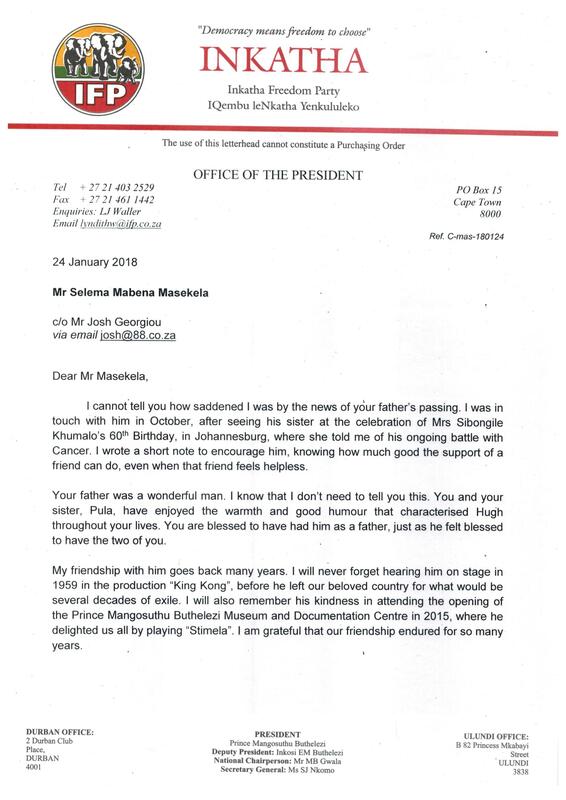 A statement from the trumpeter’s family said Masekela “passed peacefully” in Johannesburg, where he lived and worked for much of his life, on Tuesday morning. “A loving father, brother, grandfather and friend, our hearts beat with a profound loss. 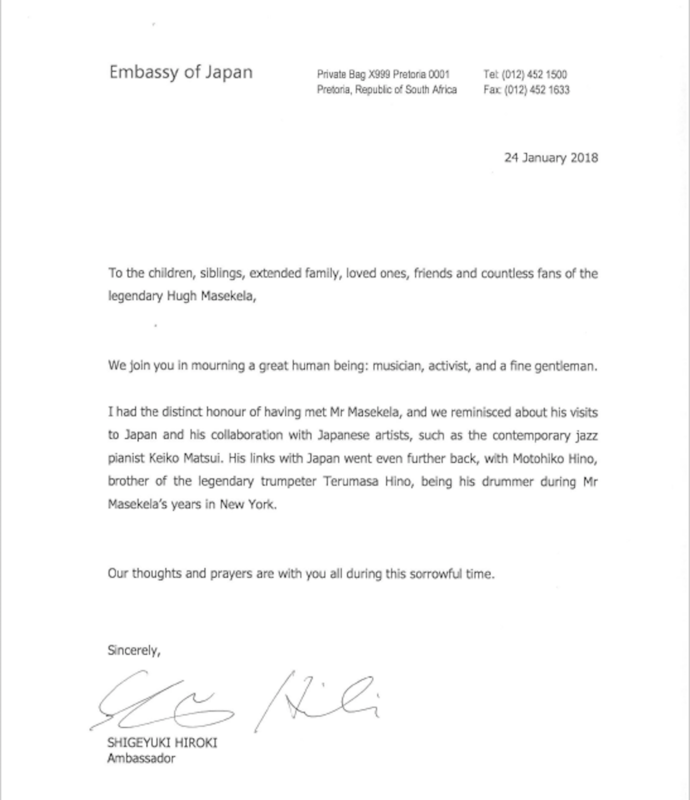 Hugh’s global and activist contribution to and participation in the areas of music, theatre and the arts in general is contained in the minds and memories of millions across six continents,” the statement read. Relatives described Masekela’s “ebullient and joyous life”. Masekela had been suffering from prostate cancer for almost a decade. 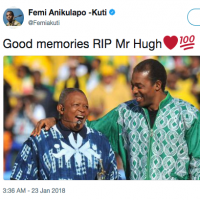 He last performed in Johannesburg in 2010 when he gave two concerts that were seen as an “epitaph” to his long career and played at the opening ceremony of the football World Cup. Masekela toured internationally until 2016. 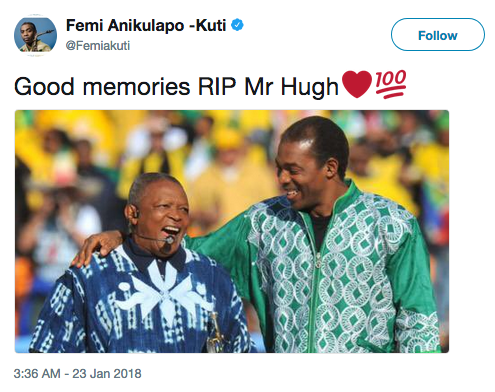 South African social media was flooded with tributes to “brother Hugh”, whose career and work was closely intertwined with the troubled politics of his homeland. Masekela was born in Witbank, a mining town in eastern South Africa, and was given his first trumpet by the anti-apartheid activist archbishop Trevor Huddleston, who formed a pioneering jazz band in Soweto in the 1950s that became a launchpad for many of South Africa’s most famous jazz musicians. Masekela went on to study in the UK and the US, where he had significant success. As well as forming close friendships with jazz legends such as Miles Davis, John Coltrane and Charles Mingus, Masekela performed alongside Janis Joplin, Otis Redding and Jimi Hendrix in the 1960s. He returned to Africa where he played with icons such as Nigeria’s Fela Kuti, and in 1974 he helped organise a three-day festival before the “Rumble in the Jungle” boxing clash in Zaire (now the Democratic Republic of the Congo) between Muhammad Ali and George Foreman. In 1976, the man who became known as the father of South African jazz composed Soweto Blues in response to the uprising in the vast township. He toured with Paul Simon in the 1980s while continuing his political engagement, writing Bring Him Back Home (Nelson Mandela) in 1987. The song became an anthem of the anti-apartheid struggle. 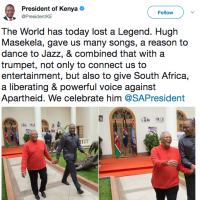 James Hall, a writer and broadcaster who spent time with Masekela in the 1990s, said he “could have prickly personality” at times “due to the tension and frustration of being away from his own country for so long”. 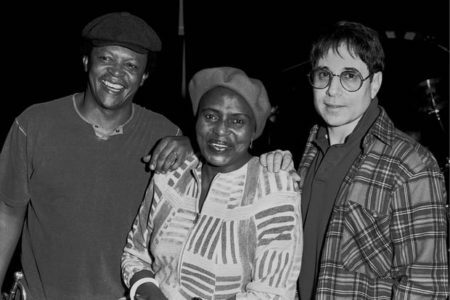 Masekela was briefly married to Miriam Makeba in the 1960s and remained on good terms with the South African singer after their divorce. “They had a wonderful friendship and were very, very close,” said Hall, who co-wrote Makeba’s autobiography. Masekela refused to take citizenship anywhere outside South Africa “despite the open arms of many countries”, said his son, Selema Mabena Masekela, on Tuesday. 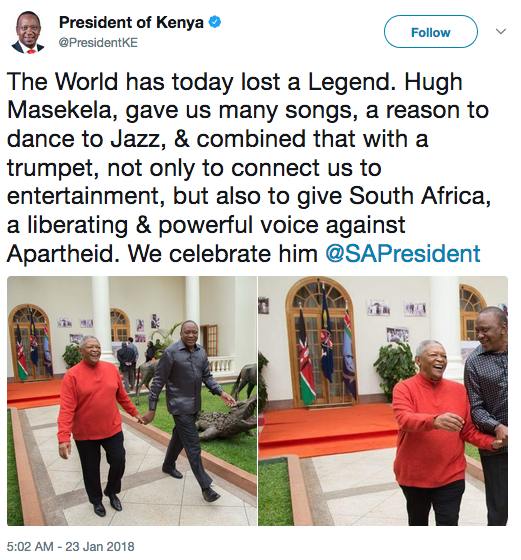 After more than 30 years in exile, Masekela returned to South Africa in the early 90s after the release of Nelson Mandela from prison and the end of apartheid. Masekela had many fans overseas. “Hugh Masekela was a titan of jazz and of the anti-apartheid struggle. His courage, words and music inspired me … and strengthened the resolve of those fighting for justice in South Africa,” said Jeremy Corbyn on Twitter. Hugh Masekela was that rare combination of musicianship and integrity: he created music that perfectly encapsulates a period in time, a movement for freedom and the spirit and hopes of a people. But, however much his music bristles with protest, in person he was always so calm and collected, and although his stately manner let you know you were in the presence of greatness, he was always approachable. He had a disarming smile and a sharp wit, and often wisecracked about the irony of me, a “London boy”, being called Soweto, but I have no doubt that he valued the name my parents had given me, and understood his own role in bringing the story of the Soweto Uprising to international attention. He achieved the holy grail of being technically accomplished but also the creator of a wholly original style of trumpet phrasing. His way of repeating rhythmical motifs, his driving sense of beat and his unique tone were infused with distinctive African qualities, making music that was instantly recognisable as his own. On stage, he was completely grounded – he never over-played, or needed prove anything. We travelled to Paris, Budapest and London for 2006’s Jazz Odyssey tour, and, night after night, with an economy of both movements and notes, he’d produce music that seemed sculpted from gold. Just hearing a few notes I could imagine what the shebeens of 1950s Sophiatown might have felt like. He’s birthed generations of artists in South Africa and beyond, determined to fuse jazz and other genres with a very personal experience and culture. I learnt from Masekela’s music and his words, but also from how he chose to live his life. Examples of his principled stance on things were born out by his life choices. He never returned to live in an ethically compromised “New South Africa” as the reality of inequality and economical hardship had strayed so far from the ideals. He always made time for fans – staying behind after shows to meet them, many of whom, like him, had been in long exile from Apartheid South Africa. And, like the greatest bandleaders, his spirit, generosity and warmth infused all the musicians in his band. I’ve rarely played with a group who were so keen to swap stories, share music and encourage each other. I always left our musical encounters feeling emboldened to follow my own direction. In 2015 I was invited to play at a private party where, unbeknown to me, Hugh Masekela was the guest of honour. I performed a version of Scarborough Fair from the balcony overlooking the guests, and, afterwards, Hugh made his way up the stairs to introduce himself. He was charmingly complimentary about my sound, and very curious about my flugelhorn, and asked if he could try it. He brought the room to a hushed silence as he started to play.Naturally I knew Masekela as one of the great trumpet players of the jazz world but, perhaps because I had just turned seven and was still living in Bahrain when Nelson Mandela was released, I didn’t know about his importance as a protester and campaigner. But I began to understand what a great man he was later that same evening, as he spoke about his life, his struggle and his music. 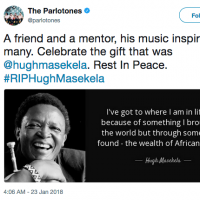 I was inspired by his passion and particularly struck by the choice he made to play music that was personal to him and his South African heritage. 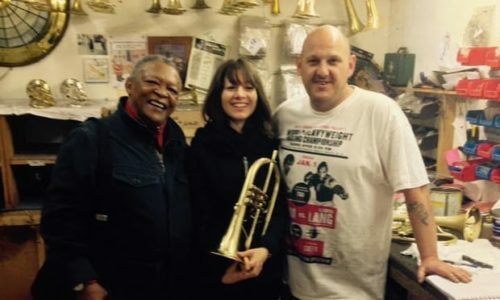 Masekela had been so impressed by the few notes he played on my horn that he decided he wanted to buy one for himself, and later that month we went together to the Eclipse Trumpet factory in Luton to chose him a flugelhorn. It was lovely spending time with him, playing to each other and getting geeky about all things trumpet. He even signed the wall in the factory, a tradition started by the master instrument maker Leigh Mckinney, who delivered Hugh’s newly made flugelhorn to him at the Love Supreme Festival just a few days later. Later that year I got to see him performing at the Barbican where he sang and played his heart out, telling more stories about his incredible life. He filled the hall with his joyful sound, accompanied only by a pianist, and held the audience in the palm of his hand. The world has lost one of its greatest musical communicators, human rights activists, and biggest smiles. Everywhere I went in London on Tuesday I seemed to hear Hugh’s music. Dare I say the only positive side-effect in the passing of the greats is that the airwaves generally improve for a period of time as we remember the extraordinary music left behind? I first worked with Hugh Masekela back in 1995 as a member of a group called the London Afro Bloc. We were essentially the backing band for both him and another musical giant, Manu Dibango, who were performing as part of Africa Expo. I’ll never forget the “WTF?” look on Hugh’s face when we met for our first and only rehearsal on the day of the performance and the true stripped-down, no-harmony-instrument-in-sight nature of our lineup was revealed. He was clearly expecting something else and let his concerns be known in no uncertain terms. Mr Dibango smoothed things out and everything went ahead fine, but I was left with the impression that Mr Masekela was certainly not someone you’d want to upset. Some years later I was asked to arrange some music for a concert that would feature Gary Crosby’s Big Band Jazz Jamaica Allstars and a choir alongside Masekela’s voice and horn. I reminded him that we had worked together nine years before. He remembered the occasion, if not me. “I was a different person then” he said. He’d clearly been through some transitions and dark times but had come through the other side – with the help of Tai Chi and family, he told me. We spent many days together, working on arrangements, rehearsing singers, he ordered us Chinese food (there was no time to cook), and we travelled across East London visiting schools. On every occasion, his commitment to the song, to inspiring the kids, and to instilling in everyone the importance of doing a great job was unwavering. The next time we worked together the ante was upped once more. When invited to perform his first full orchestral concert with the London Symphony Orchestra at the Barbican one of the conditions he set out was that I would be responsible for all the musical arrangements. Added to this the orchestra commissioned me to write a Flugelhorn concerto for Masekela to play with the orchestra. For me, he is one of a handful of trumpet players who ‘owns’ the sound of the Flugel in the same way Miles Davis ‘owned’ the sound of the Harmon muted Trumpet. My concerto, All Souls Seek Joy, was premiered in 2007 and was partly shaped by my response to spending time in South Africa and being overwhelmed by the sheer beauty of the place. 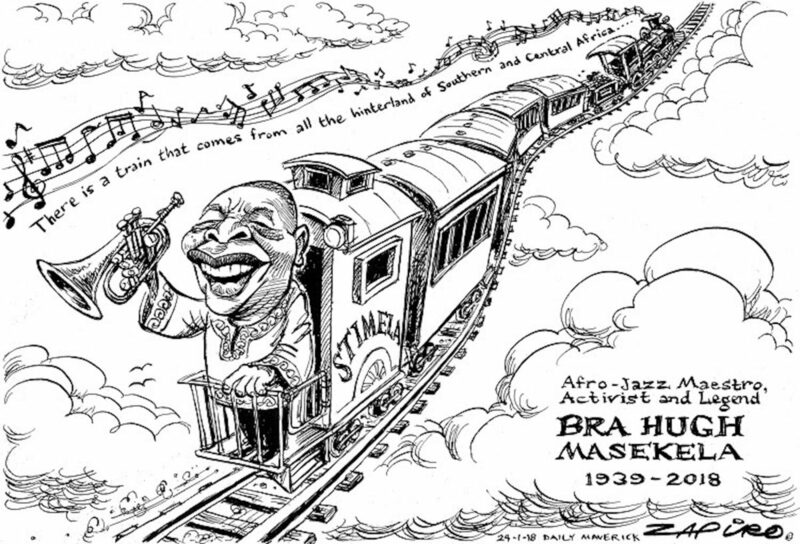 That same programme featured also Stimela, Masakela’s anthem telling the story of the train taking migrant workers to the deep, dirty work in the mines. You can hear years of struggle alongside immense hope and joy in his voice. No matter how many times I heard his impression of train whistle it always went straight to my heart. Masekela managed to cram such a multitude of lives into his 78 years. He was the man child who discovered the trumpet just at the right time and chose that over certain trouble. He was endorsed by jazz legends Louis Armstrong and Dizzy Gillespie. And then the politics – how could any musician in South Africa, especially a black one growing up with Apartheid, not be a political figure? Of course he pushed against this terrible agenda over many years in exile. And then there is the romance – he and Miriam Makeba were the original black music power couple way before the Jay-Z/Beyonce era. 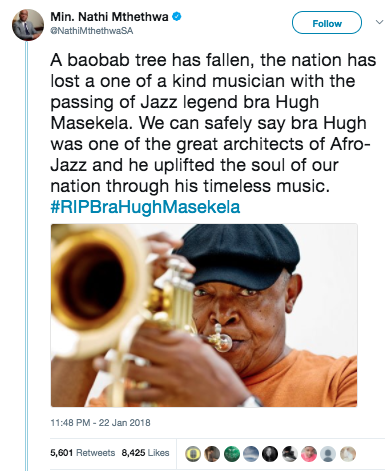 It’s traditional to say rest in peace on these occasions and Bra Hugh truly deserves the rest, but I dare say if he’s able this unquenchable spirit will at least on occasion do his stage shuffle and blow his horn. 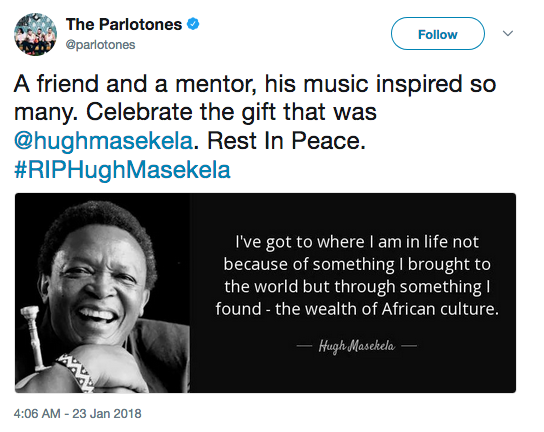 The International Committee of AFRIMA (All Africa Music Awards) celebrates the life of an African music icon and activist, Hugh Masekela as he passed on peacefully at his country home, Johannesburg, South Africa after a protracted battle with prostate cancer on January 23, 2018 at the aged 78. Masekela was nominated for three nominations at the 2017 AFRIMA Awards in the categories of ‘Best Male Artiste in Southern Africa’ for his recent single ‘Shango’, ‘Album of the Year’ for his recent album ‘No Borders’ and for the ‘Best Artiste in African Jazz’. These three nominations show that the legend waxed strong till his last breadth. Masekela was scheduled to be at the host city, Lagos, Nigeria, for the 2017 AFRIMA Awards in November but was unable to make it due to his ill health in spite all his efforts. Masekela gained global recognition with his distinctive Afro-Jazz sound and hit song-Soweto Blues. He creates music from his Africa’s experiences andis known for excellent use of trumpet, flugelhorn, trombone and cornet instruments. Born in April 4, 1939 and ventured into music as a child when the anti-apartheid chaplain, Archbishop Trevor Huddleston gave him a trumpet as a gift. He found escape from the racial chaos in South Africa in his days with music. He later joined the Johannesburg Native Municipal Bras Band, Uncle Suada.In later years, Masekela studied the art of music in London’s Guildhall School of Music and the Manhattan School of Music, New York. The legend had released 49 Albums from the 1966 to 2016 and featured legends like Paul Simon, Lady Smith Mambazo, Mariam Makeba and others. He was nominated for the Grammy Awards for Best Contemporary Pop Performance – Instrumental in 1968 for his single ‘Grazing in the Grass’, an anti-apartheid piece which sold 4 million copies among other nominations. AFRIMA will pay tribute to Hugh Masekela in a glorifying spectacle at its fifth edition scheduled to hold in November 2018.